Cover-Roll Stretch Adhesive Fixation Dressing by BSN Medical offers soft and stretchable polyester material which allows the tape to contour and secure primary dressings. The roll offers easy application and molds around the body to shape to areas such as the shoulder, leg or torso. BSN offers a variety of width options to accommodate and adapt to small or large wound sites. The small amount of compression makes the Stretch Bandage flexible and effective on these movable and hard to bandage regions of the body without binding or causing restriction. 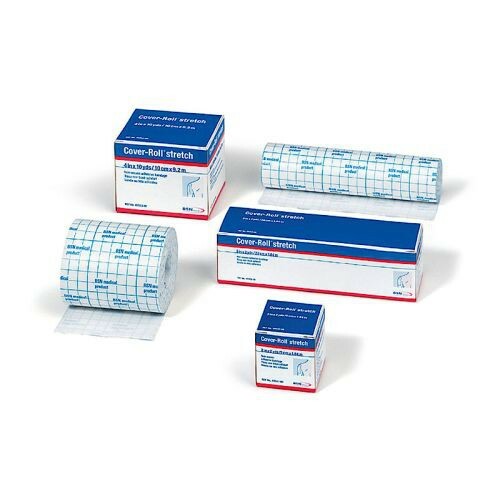 The Cover Roll Tape can easily be cut to size and secure any size or type of gauze or wound dressing. This medical stretch tape is hypoallergenic and is 100 percent latex free. The cover-roll tape has an easy-to-peel split back liner and is made with a polyacrylate adhesive known for a reliable hold even when it gets moist from sweat or bathing. Although this secondary bandage is not waterproof, it is air and exudate permeable. BSN Medical Cover Roll Stretch Tape is also Radiolucent, or Radio-transparent, eliminating the need to remove bandage in preparation for x-ray examinations. Does this product come in another color. I would prefer it be in beige. This product is only available in one color. I use the 4-inch wide tape for securing large ABD pads to my thigh. The tape adheres well, has enough stretch to hold well during normal activities like doing chores, walking, or climbing stairs, and even holds well when it gets wet. The 4-inch width is a little tricky to apply and takes some practice. Long pieces of tape tend to curl as the backing paper is pulled off, and if two adhesive surfaces come into contact it's game over. Throw that piece away and start again. It is easier to use shorter lengths that curl less and are easier to manage. In spite of the good holding power removal is not difficult. I like this product. Very nice product, super fast delivery. Excellent product that I have been using for the last 7 years. An excellent product that I have used for many years. It holds up very well for what I use it for. I run marathons and 1/2 marathons and need the cover roll stretch tape to be the base for taping my ankle. Has been great. I ordered this tape in June and I have still not received it, so, no, I am not pleased with your service. This is a good cloth tape. It stretches well and sticks well even if it got wet. This compression bandage worked just as I hoped It woul. It adhered to my skin to keep my gel strips in place post sugery and did not aggravate my skin! After many attempts to find what I needed I finally found the right product. It is a non-woven compression bandage that consists of soft, stretchable and non-woven polyester substance that is capable of becoming accustomed to body contours. This is a polyacrylate adhesive that holds back the dressing when a patient is bathing or is susceptible to moisture. I like this product, because it can be applied easily and can be removed without much hassle. This is a terrific product and I have used it for years. Vitality Medical is an excellent place to purchase it; they're prices are good and it's always quick delivery! This bandage is not producing heat. Even when wrapped around a body part it still encourages air to go through. I can say the material being used in this product is of superb quality. No member of our family who used it complained of skin irritation or rashes. BSN Jobst Cover Roll Stretch Nonwoven Compression Bandage is excellent for areas requiring flexibility because the bandage doesn't constrain movement. Adheres with a slight amount of compression for covering a dressing in one application. Air and exudates permeable.